The women of India have exhibited great courage, leadership, and bravery in times of need from ancient times. They proved that fighting to save or free the motherland are the greatest services that one could render, even at the peril of risking one’s life. The first name that comes to mind is that of the famous Rani Laxmibai of Jhansi. Often equated with the venerated Mother Goddess, several other women of valour have also become cult figures in India. One of the most courageous woman of medieval India, Rani Durgawati took up the reins of governance on behalf of her infant son Bir Narayan when Dalpat shah, the ruler of Gondwana (now Madya Pradesh), died in 1548. She ruled most ably for 16 years from 1548 to 1564. When the Mughal Emperor Akbar of Delhi ordered his general Asaf Khan to occupy Gondawana in 1564, Rani Durgawati led her forces against the invading army and fought with great skill and bravery. Ultimately when her defeat became imminent she plunged her dagger into herself choosing death to dishonor. Chand Bibi was one of the well known women warriors of medieval times who played a gallant part in the defense of the kingdom. 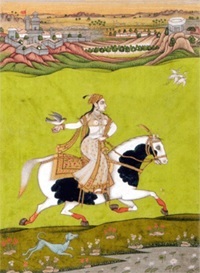 The sister of Burhan-ul-Mulk, the Sultan of Ahmednagar, Chand Bibi was the regent of the minor Bahadur. She acquired name and fame as the heroic defender of Ahmednagar in 1595 against the most powerful forces of the time, the army of Emperor Akbar. On December 12, 1595, when the imperial forces laid a siege around the Fort of Ahmednagar, Chand Bibi took up the task of defending the Fort. For three months the invaders struggled hard against the heroic resistance put up by Chand Bibi. 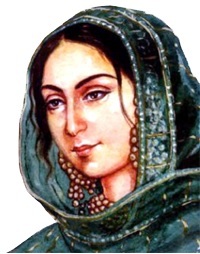 During the long siege, Chand Bibi defended the Fort with astonishing gallantry and resolution. Not content merely with defence tactics, she attacked the enemy under the cover of darkness by surprise, and often broke through the forces of the mighty Mughals. Sensing the weakened resistance of the Mughals, Chand Bibi finally proposed a treaty that had to be accepted by the Mughals. Bahadur was accepted as the Nizam-ul-Mulk though under the paramountcy of Akbar. Thus with her remarkable, courage and bravery, combined with astute diplomacy, she saved her motherland from Akbar’s forces. This tradition of chivalry by women blossomed during India’s struggle for freedom from British Raj when thousands of women actively fought for the freedom of their motherland. Women’s participation in India’s freedom struggle began as early as 1817 when Bhima Bai Holkar fought bravely against the British colonel Malcolm and defeated him in guerilla warfare. 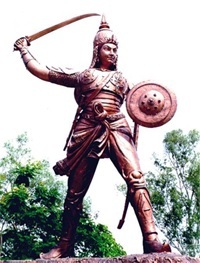 Another brave fighter was Rani Chennama (1778 - 1829) of Kittur, a princely state of Belgaum in Karnataka, who valiantly resisted the armed might of the East India Company in 1824. Chennamma received training in horse riding, sword fighting and archery in her young age. When her husband, Raja Mullasarja of Kittur, died in 1816 and her only son died in 1824, Chennamma adopted Shivalingappa as her son and made him heir to the throne. The British ordered the expulsion of Shivalingappa. The Rani defied the order. A great battle ensued. The Rani fought the British with great courage and skill. She was taken captive and lodged in Bailhongal Fort where she died on 21st February, 1829. Rani Avantibai raised an army of four thousand men and led it herself against the British in 1857 when the British put the state under court administration after her husband Vikramaditya Singh, the ruler of Ramgarh State, died leaving behind no heir to the throne. Avantibai vowed to win back her land from the British. A fierce battle ensured and Avantibai fought most valiantly but could not hold out for long against the superior strength of the British army. When her defeat became imminent she killed herself with her own sword and became a martyr on 20th March, 1858. 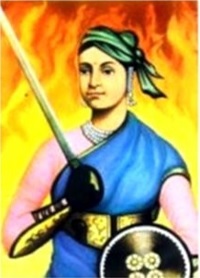 Rani Lakshmi Bai of Jhansi (1834 - 1858) is remembered for her remarkable courage. Her heroism and superb leadership laid an outstanding example for all future generations of women freedom fighters to rise against oppressive rule. Dressed in men’s clothes, the Rani of Jhansi led her soldiers to war against the British. Holding the reins of her horse in her mouth she used the sword with both hands. Under her leadership the Rani's troops showed undaunted courage and returned shot for shot. Even her enemies admired her courage and daring. She fought valiantly and although beaten she refused to surrender and fell as a warrior should, fighting the enemy to the last. Even as a child Laxmibai learnt horse riding and sword fighting. When both her husband Raja Gangadhar Rao head of the state of Jhansi and her only son died in 1853 she adopted a son and made him the heir to the throne. The British Governor General Dalhousie refused to recognize her adopted son as heir to the throne and ordered annexation of Jhansi into British Raj. Rani Laxmibai refused to part with Jhansi. A fierce fight ensued. The Rani fought the British undauntedly leading her forces from the front and showed great courage and skill. She was fatally wounded in the battle and she breathed her last on 18th June, 1858. Considered as the best and bravest military leader, this epitome of courage died a hero’s death in the battlefield. Rani Laxmibai’s courage, deeds of valour and heroic battle against the British have become the theme of many a folklore and ballad in the country. She is the immortal warrior the country has ever seen. Like Rani Laxmibai of Jhansi, the heroic exploits of Jalkari Bai are still sung in the folklores of Bundelkhand. A village girl, Jalkari Bai hailed from a very poor family in Jhansi. It is said that she had an encounter with a tiger while she was collecting firewood in the jungle and she killed the tiger single handed with her axe. She served in the women’s wing of Rani Laxmibai’s army and had a striking resemblance to Rani Laxmibai of Jhansi. With the outbreak of the Revolt in 1857, when there were several British raids on the Jhansi Fort the Rani became determined to fight back and she repulsed every one of the attacks. During 1957-58 when the fall of the Jhansi fort became imminent Jalkari bai convinced Laxmibai to escape quietly with the help of supporters. In a ploy to deceive the British, Jalkari bai dressed herself up like the Rani and took command of the army. Jalkaribai fought the British forces valiantly but was eventually forced to surrender. The British general, impressed by her loyalty, courage and fighting prowess treated her with respect and set her free. Born in a poor family Rani Rashmoni (1793 - 1861) was married into a wealthy zamindar family of Calcutta. After the death of her husband the management of zamindari fell on her shoulders and she showed great managerial skill and leadership in her new role. Rani Rasmoni’s nationalist outlook brought her in direct confrontation with the British rulers and each and every time she had her way and the British could not prevail upon her. During the First War of Independence in 1857-58 the British deported Nawab Wajid Ali Shah of Lucknow to Calcutta. His wife, the Begum of Avadh, Hazrat Mahal joined hands with the mutineers and seized control of Lucknow. She rejected with contempt the promises of allowance and status held out to her by the British and resisted the British forces with all her might. However, she could not hold out for long and escaped to Nepal where she died in 1879. Born in Chittagong (then part of Province of Bengal in pre-independence India), now in Bangladesh in 1911, Pritilata Waddedar joined Surya Sen’s armed resistance movement in East Bengal in early 1930s. In 1932, Surya Sen assigned Pritilata to lead a team that would attack the Pahartali European Club, which bore the notorious sign ‘Dogs and Indians not allowed’ on September 23, 1932. The raid was successful but Pritilata, dressed as a man was trapped without a way of escape on that fateful night. She committed suicide by swallowing the potassium cyanide that they were instructed to carry with them so that in case they were caught by police they could swallow it before the arrest. While Pritilata Waddedar died while conducting a raid, revolutionary Kalpana Dutt (now Joshi), fighting for freedom of her country, was arrested and tried along with Surya Sen and given a life sentence. In December 1931, two school girls of Comilla, Santi Ghosh and Suniti Chowdhury, shot dead the District Magistrate. In February 1932, Bina Das fired point blank at the Governor while receiving her degree at the Convocation. When the entire Congress leadership was put in jail in 1942, women leaders like Aruna Asaf Ali and Sucheta Kripalani emerged to lead the underground resistance. Born in Nangkao village of Manipur Rani Gaidinliu (1915 - 1993) came in contact with the political and spiritual leader of the Nagas Haripau Jadonang who started a movement to drive away the British from Manipur. When Jadonang was hanged by the British Gaidinliu took over the leadership and challenged the Britishers. The British Govt. tried to suppress her movement. She went underground. The army made a house to house search and finally captured her in 1932 and sentenced her to life imprisonment. Jawaharlal Nehru called her ‘Rani of the Nagas’ for her indomitable spirit and aggressive fight against the British. She spent more than 15 years in jail and was released only after Independence. There are countless other women who fought bravely for their own and their country’s independence and sovereignty. As citizens of independent India we pay our homage to those chivalrous women of our country who sacrificed their lives fighting for a cause. @Dr. Chaudhuri: Thanks for the inspiring tales of courage and sacrifice by the women of India in the medieval period. Did not have a chance to reflect on this before. I am proud to realize that this part of our heritage is praise worthy with no hesitation.